Every year in November, Pack 1344 participates in a community service project call “Scouting for Food”. 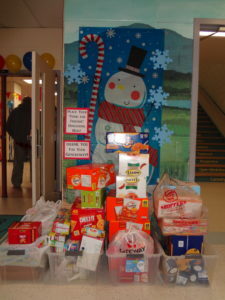 It is one of the largest food drives in the area. Our scouts distribute plastic bags to homes within our community. It is usually on the first Saturday in November. Then the Webelos & AOLs work together with Boy Scout Troop 1344 to pick up the bags filled with nonperishable food on the following Saturday. Once the food is collected, it is taken to a local food bank. The scouts collected donations for the “Food for Friends” program at the 2017 Winter Carnival. “Food for Friends” program provides a gallon Ziploc bag of food to elementary school children who might not otherwise have meals on the weekend. 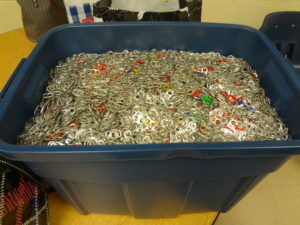 The scouts helped to raise funds for the Ronald McDonald House Charities by collecting soda can tabs. The Ronald McDonald House Charities help to ease the hardship of childhood illness on children and their families. To encourage scout participation and to make it fun, there was a friendly competition to see which rank brought in the most tabs.